About a month ago when I was at the Grand National Roadster Show, I was drawn to a display from a shop called Hot Rods and Hobbies out of Signal Hill, California. 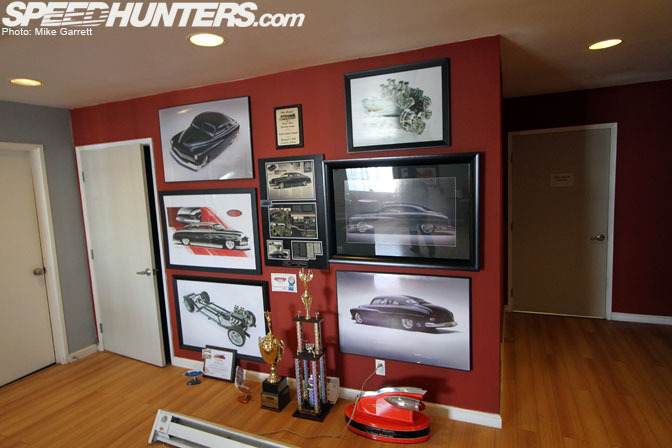 Not only did their cars impress me, but owner Scott Bonowski was given the prestigious "Builder of the Year" award. Surely, a visit to this place would be in order. I contacted Scott and in a very relaxed manner he told me to drop by anytime. Last week, I arrived at this large nondescript building to Signal Hill to have a look. My first impression was – "this place is huge". 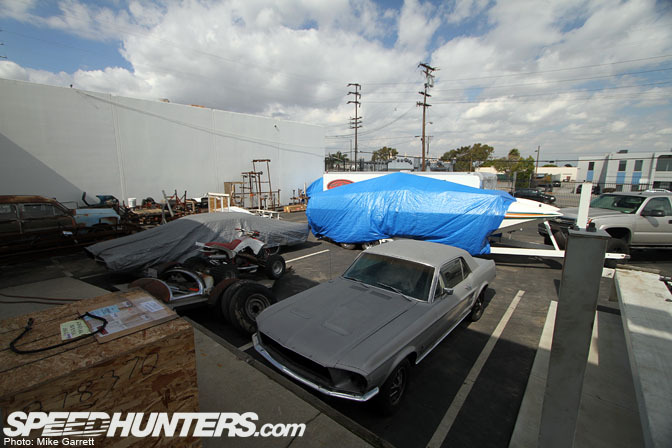 The entire building was packed full of cars in various stages of completion. 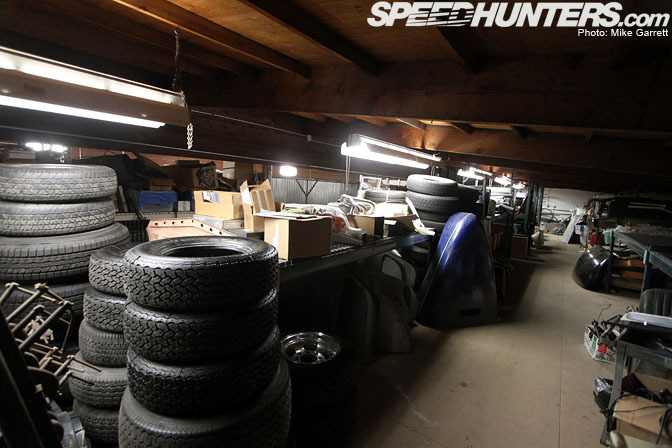 Scott has been building cars for 20 years, and the shop has been in its current location for about three years now. 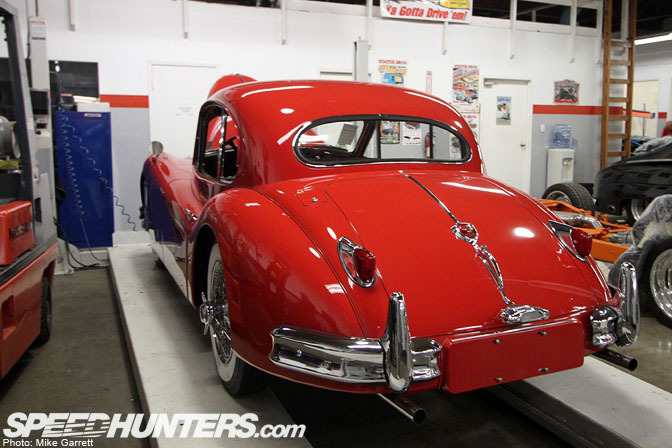 The first vehicle Scott showed me is one the shop's most well known – this stunning '50 Merc. The car showed up to the shop as a mild cruiser and was eventually transformed into this ridiculous custom. 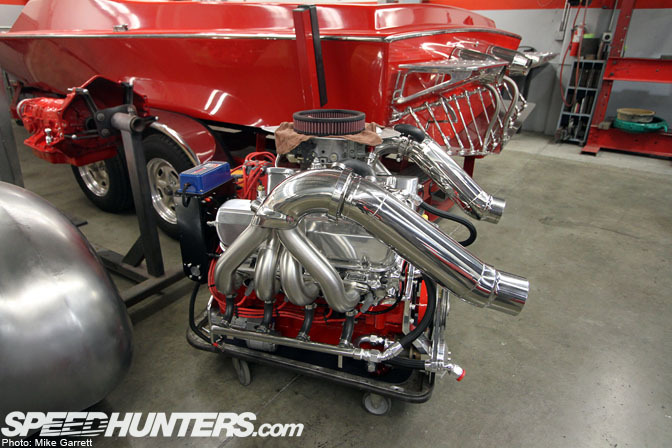 Powering this sled is a fuel injected big block GM 502 with retro style stacks. 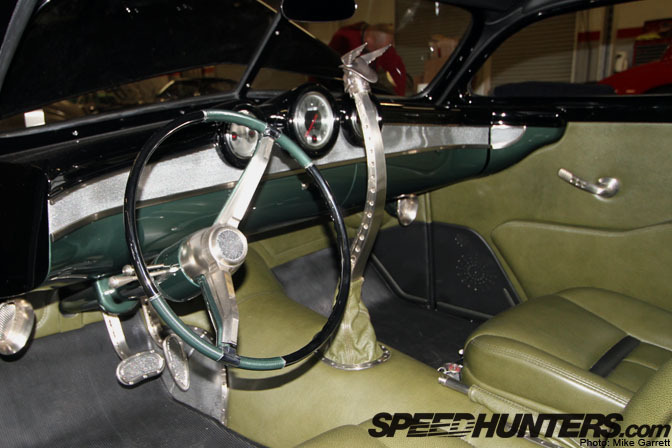 The Merc's interior as just as impressive. Get a load of that one-off shift lever! 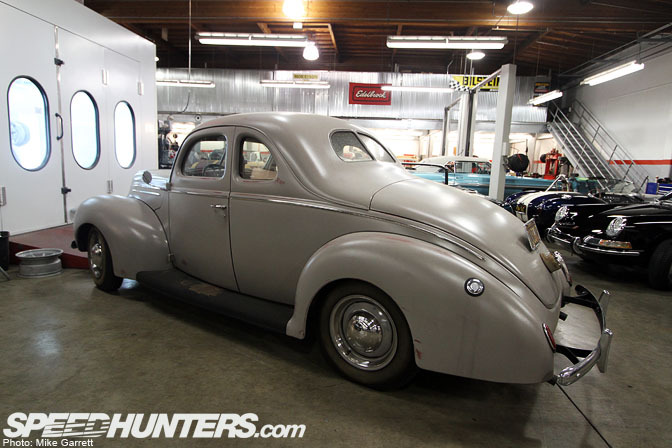 I was thinking that the shop dealt mainly in hot rods and other classic American cars, but it turns out they also have a lot of exotic European projects as well. This Murciélago was in the shop for some paintwork after fire damage. 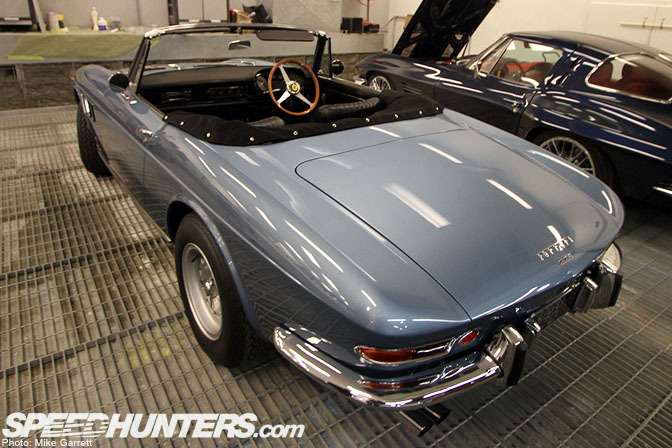 This extremely rare Fiat Dino Spider was also around the shop. I can't recall ever seeing one of these cars before. The Fiat was in concourse condition inside and out. Stunning. 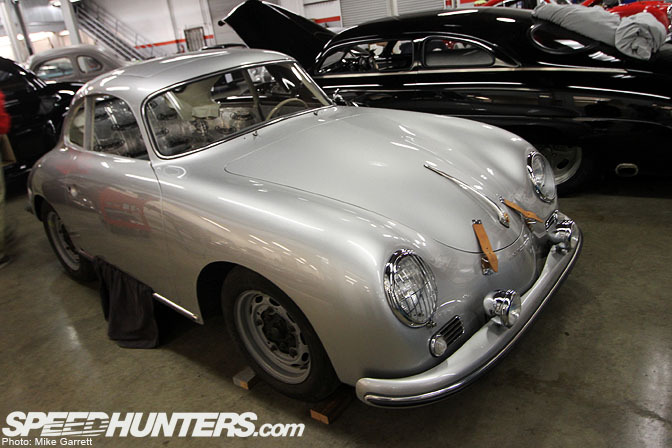 …but it's in the process of getting a full 911 drivetrain. Check out the factory style exhaust system that's been outfitted to the flat six. In the paint and body area, this cool little Ford Falcon was found. A father-daughter project apparently. There probably aren't too many shops out there where you'll find a Ford Falcon sitting a few feet from a Ferrari 275 GTS – one that just happens to have been owned by guitar god Eric Clapton. This Ford was in amazing shape. 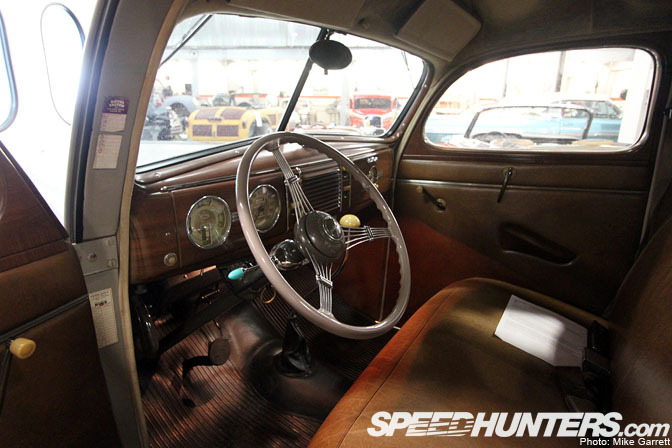 Cosmetically, it's largely untouched since it left the factory back in 1939. That's the original factory trim! 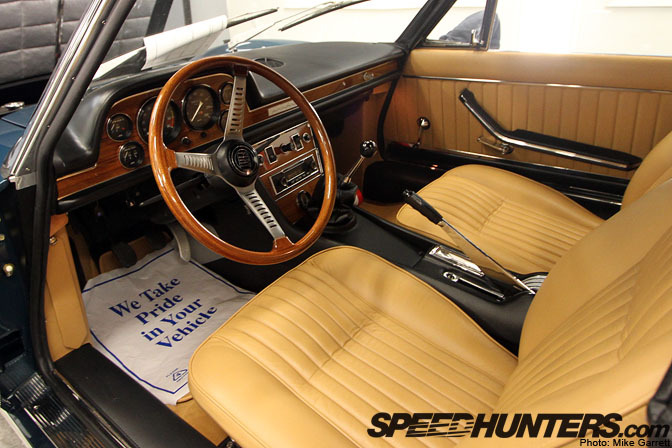 The interior is also completely original, save for the seats which have been redone. 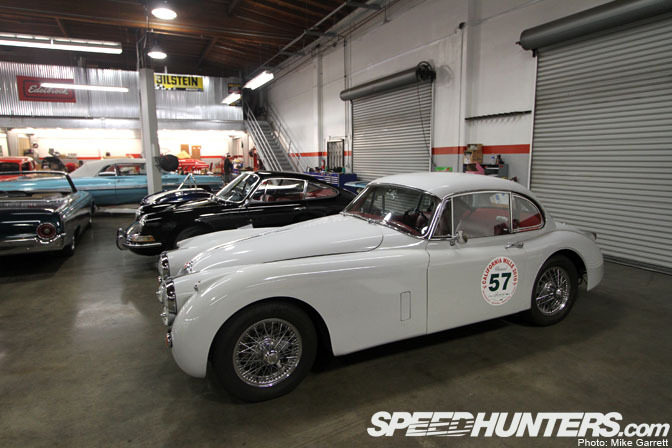 …and another that has been massaged to compete in road rally events like the California Mille. 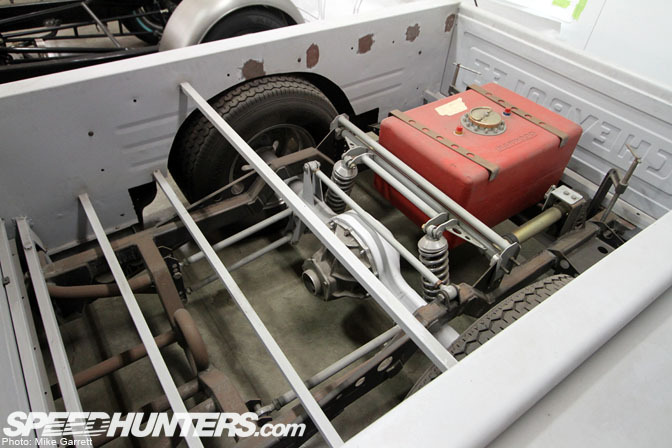 This mean looking drop top Ford is one Scott's personal projects. 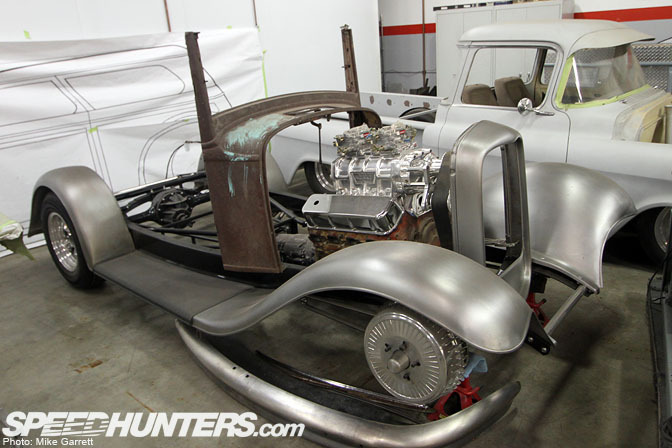 Hot Rods and Hobbies does everything from full custom car builds to body work and maintenance. 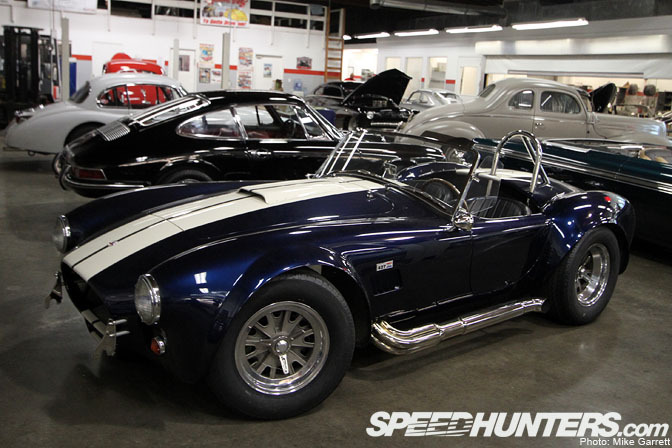 This freshly-completed 427 Cobra replica was in for a few finishing touches. Make that a lot of finishing touches. 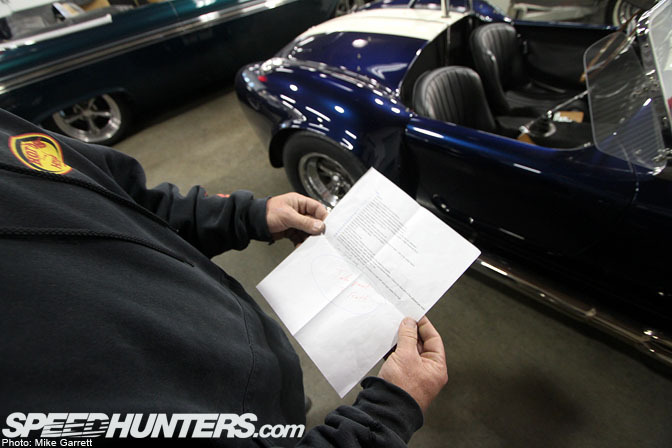 Here Scott is looking over the list of work that needs to be done on the Cobra. This '62 Pontiac convertible was in the shop having some maintenance done. While the exterior of this Mustang Coupe looks original, it's just been totally redone underneath. New suspension, chassis work, and a mean stroker motor in the engine bay. Can marine vessels be considered hot rods as well? 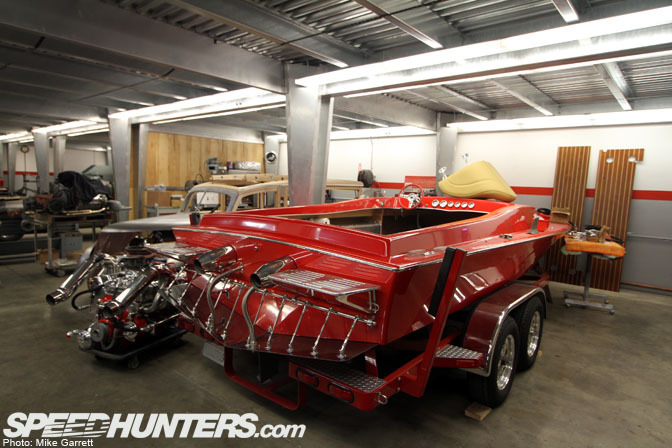 This vintage speed boat is another one of the shop's projects. This should make enough power to have some fun out in Long Beach harbor! 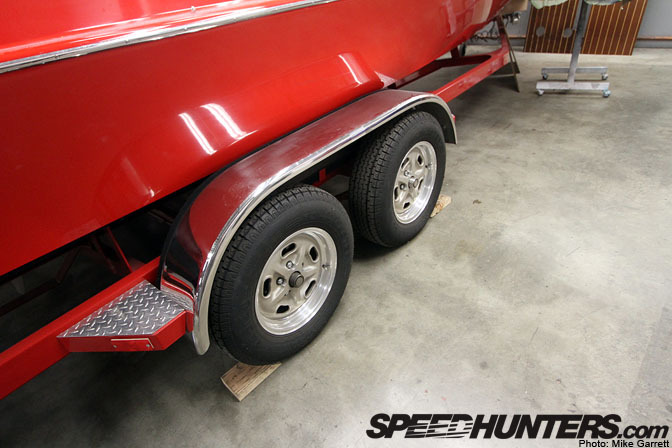 Even the trailer is sporting vintage kidney bean style wheels. 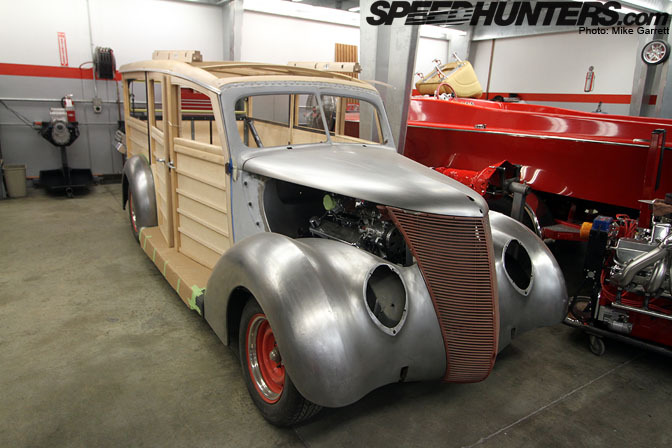 This Ford Woodie was once a taxi cab in Australia, now its undergoing transformation into a very unique hot rod. That's Ford 5.0 power under the hood. The woodwork on this thing was amazing! Can't wait to see what the finished product looks like. The next stop on the shop tour was the metal work area. 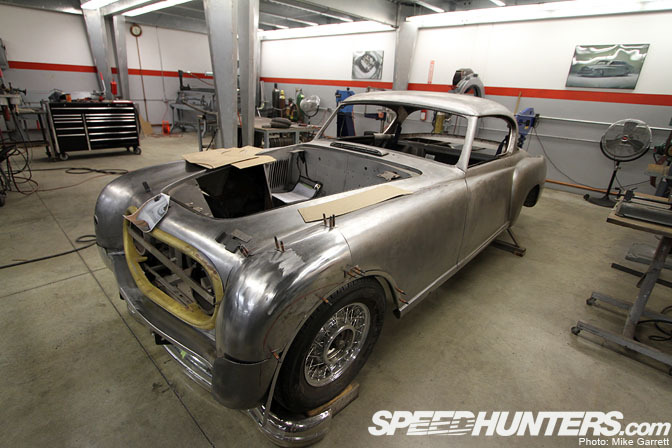 This '54 Nash Healey was has getting some work done in the metal area. Like the Jag, this one is also being built for road rally action. 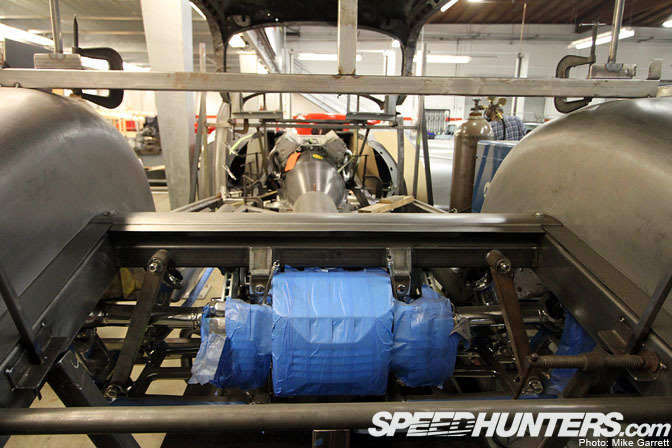 That chassis you see back there is one the shop's most intensive projects at the moment. 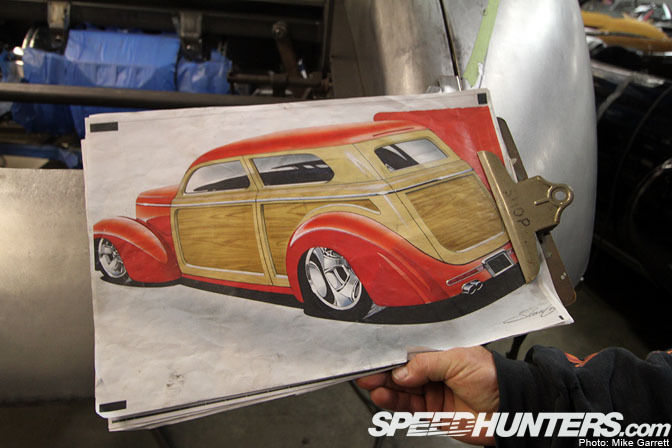 It's a four-door Willys woodie that's being transformed into the low-slung two-door woodie you see in this Steve Stanford rendering. 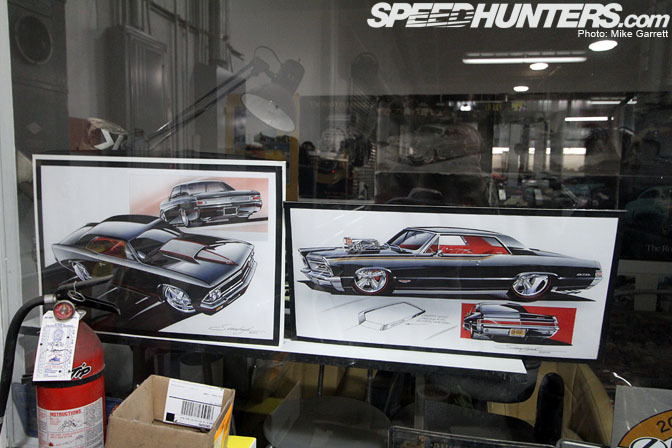 Steve does all the renderings for the shop builds. The amount of work going into this project is staggering. As you can see, this one still has a while to go. 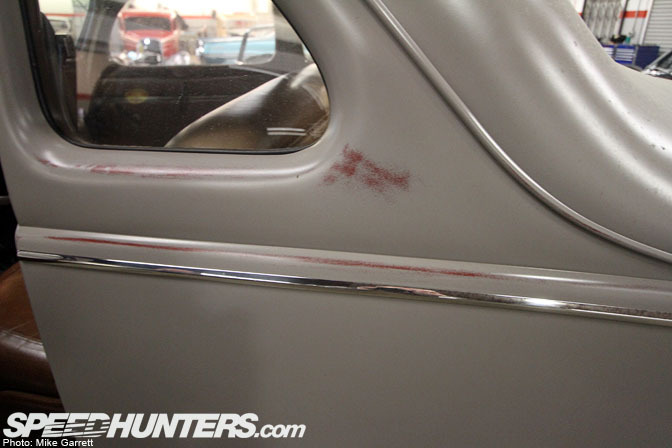 This '48 Caddy sedan is being built into four-door hardtop. A "what if?" style custom. 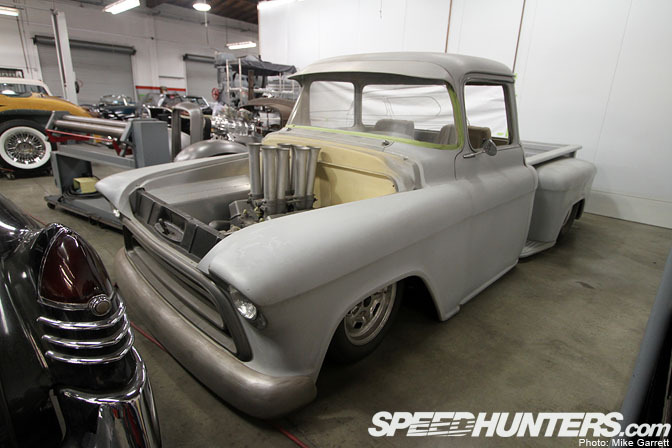 This slammed Chevy pickup is another one of Scott's personal projects. 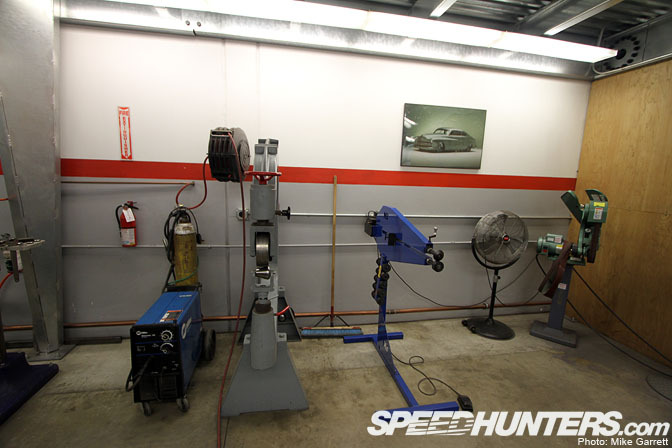 With as busy as the shop is, he doesn't get a whole lot of time to work on his own stuff. 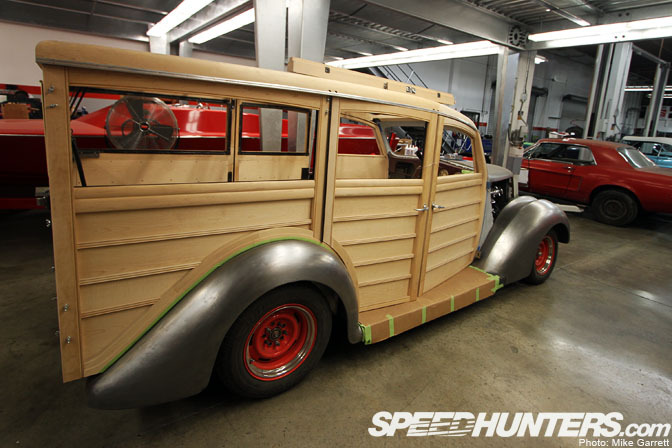 This '32 Ford is another woodie project in the works. 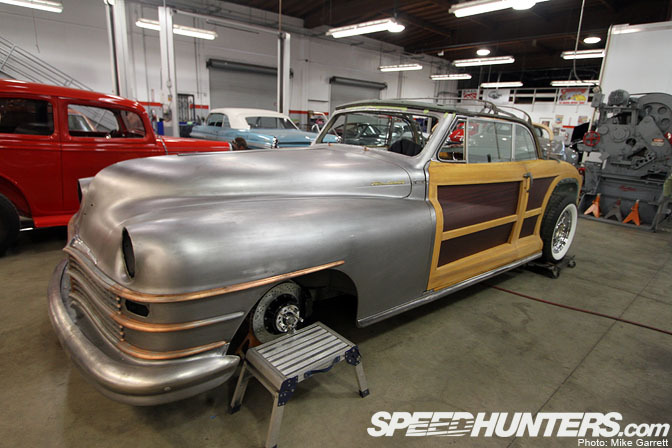 Here's one of the shop's well known projects as of late – an ultra rare '48 Chrysler Town and Country Convertible being for built for Goodguys founder Gary Meadors. You might remember this one from my GNRS coverage. That Viper V10 should make plenty of thrust to move the giant Chrysler down the highway. 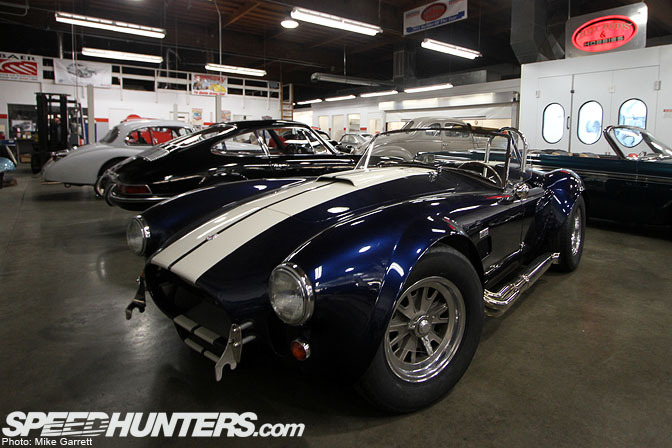 This rare Kurtis-Kraft roadster is in the shop getting a stroker motor swap. 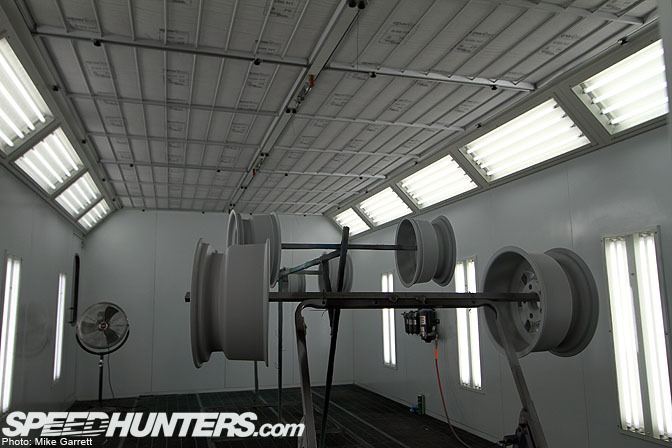 Here's the paint booth – one Scott's favorite parts of the entire shop. 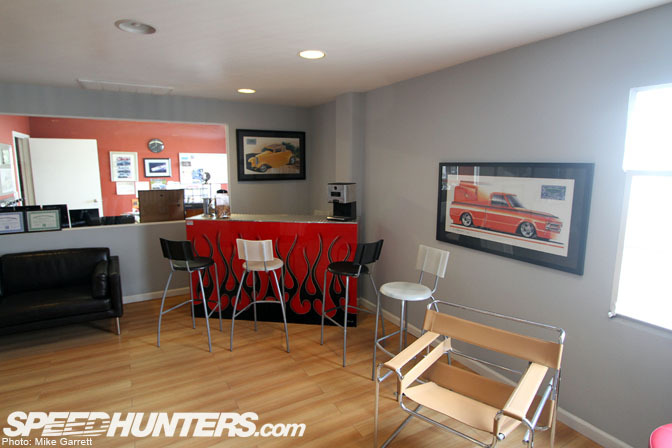 The office area of the shop is filled with posters and renderings of project cars. Surely one of the nicest customer areas I've seen at any shop! It's not glamorous, but this is a very important part of the shop. 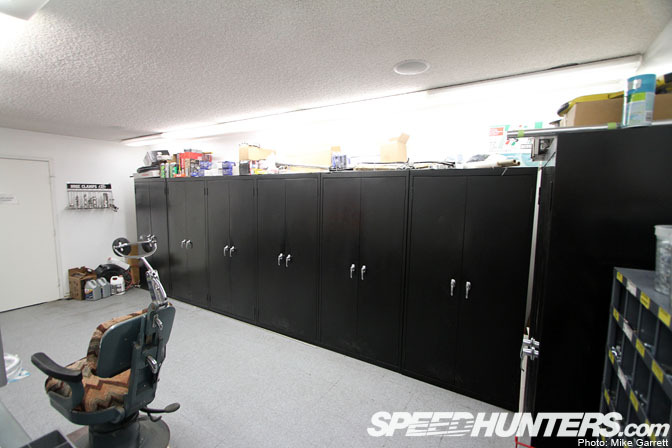 Here is where all the bolts, nuts, chemicals, and other important items are stored and organized. 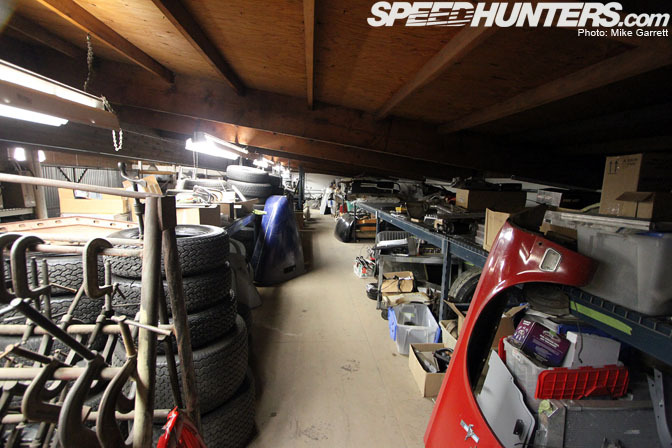 In the attic above the shop, Scottt showed me the parts storage area. Everything is kept up here to avoid clutter down below where the work is going on. The final stop on the shop tour was the "bone yard" area outside. Even though the shop is jam packed with projects at the moment, they already have some of their future builds in the works. 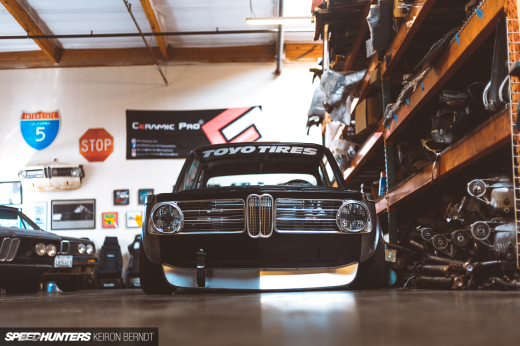 That '65 GTO project looks particularly bitchin'! I'd like to thank Scott for letting me come over and showing me around the shop. Scott and his guys stay extremely busy and there's always something cool to see here. We'll be sure to drop by more often. Rad. It's impressive the variety of work they do. It always amazes me what large piles of money can do! Is this what heaven looks like? Please tell us that you are going to do write ups on some of the individual cars! Fiat Dinos are not "extremely rare." God i love that 40 Ford! Always love these shop visits! Great Article, thanks Mike. This place is just up the street from me, and you would NEVER know what this place is from the outside. Absolutely insane garage. Thank you for the tour I could never get! 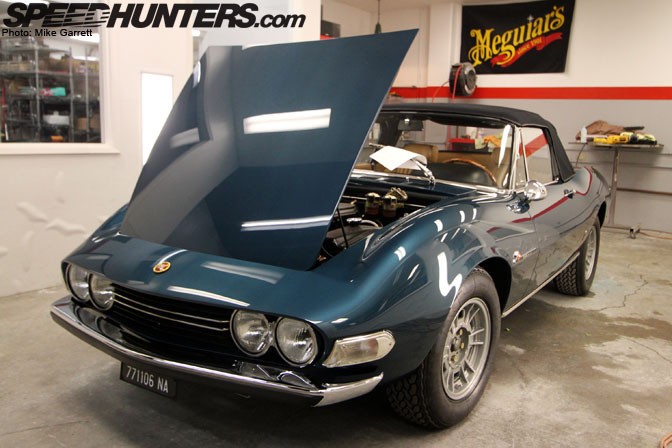 Yes, Fiat Dino Spyders ARE most definitely rare; especially 2400 models such as this. Sheesh. You know your shop is very serious when Steve Stanford does all your renderings. Amazing place. That Merdcury in the first couple pics is incredible.